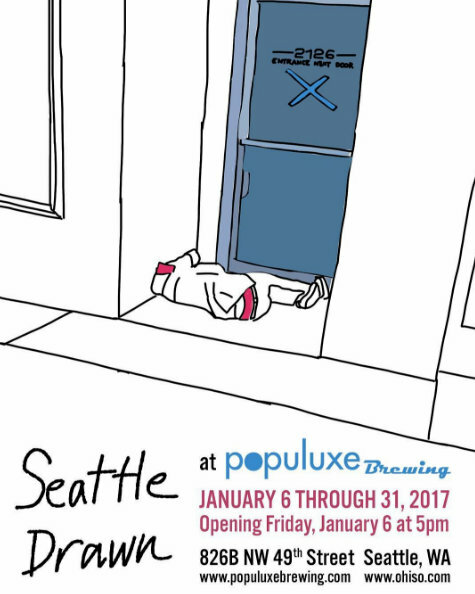 Populuxe Brewing, 826 NW 49th Street, invites you to a free opening night exhibition of illustrations by local artist Akira Ohiso, on Friday, January 6, 2017 from 5:00 pm – 10:00 pm. The exhibition runs through January 31, 2017. Additional event information available HERE. Ohiso is an artist, writer and musician who gained popularity as an outspoken blogger and social media voice. He was the co-founder and editor of Green Door Magazine, an upstate New York publication that promoted green living. He received his Masters of Social Work degree in 2003 and worked for years in the social services profession. His invaluable experience working with vulnerable populations continues to inform his engagement in the digital world. A recent transplant to Seattle, his digital drawings document the unyielding gentrification and displacement of a city that creates great wealth and great suffering. He is married and lives in Ballard’s West Woodland neighborhood with his three children.